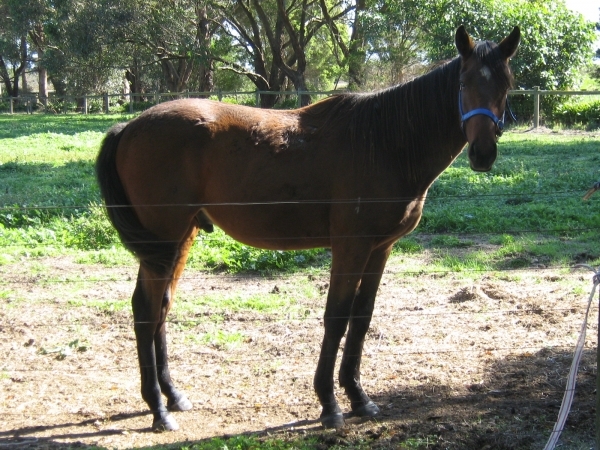 DELIGHTFUL CHOICE (AUS) (Bay 2006-Stud 2010). Unraced. 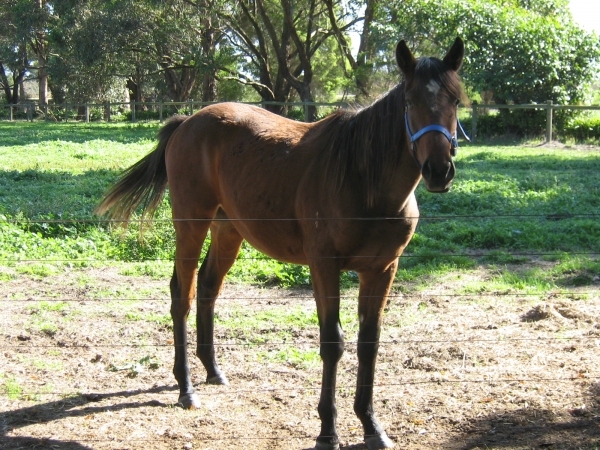 Brother to SP Rezyana (2d BTC Rough Habit P., Gr.3). Half-brother to SP Sunday Service (2d STC Sky High S., L). 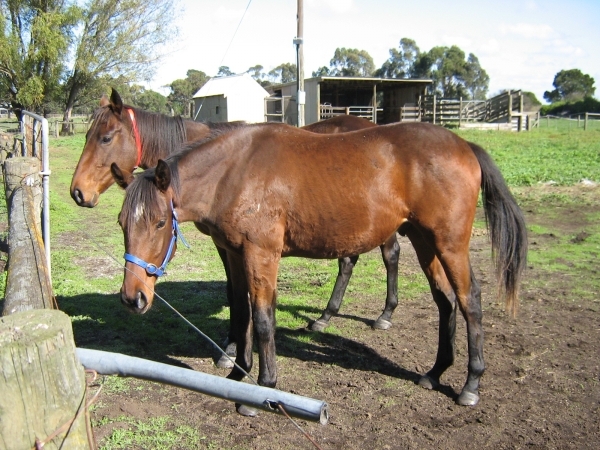 Out of SW Lady’s Delight, a half-sister to SW Announce, SW Lady Broadhurst, SW Daphne Donnelly, SW Youthful Legs and to the dam of SW Diatribe (VATC Caulfield Cup, Gr.1) and SW Al Samer. Related to SW Danehill, etc. Sire of SW Automatic Choice - Hay Run (H.K.) (VRC Taj Rossi Series Final H., L) and of Delightful Son, Greenmount Lass, Princess Atilla, Risque Rani and of the placegetters Delightful d'Or, etc. SCOOPS, by Fusaichi Pegasus. Placed at 3 in Aust. 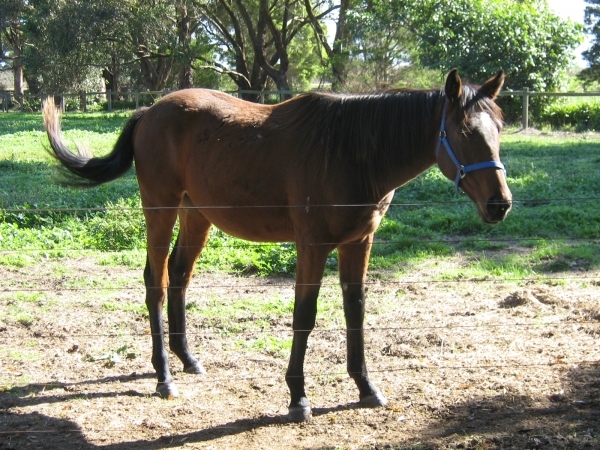 This is her fourth foal. Her first three foals are unraced. Stingray (Kaphero). 4 wins-2 at 2-to 1300m, A$142,875, to 2014-15, MRC Equiano King of Speed 2YO H., 2d MRC Vain S., Gr.3, MVRC Mitchelton Wines H., 4th MRC Debutant S., L.
SONGLARK (Singspiel). 3 wins-2 at 2-at 1600m, 2400m, Saint-Cloud Prix Thomas Bryon, Gr.3, Pontefract Castle S., L, Saint-Cloud Prix Mousko, 2d UAE Derby, Gr.2, 3d York Lonsdale Cup, Gr.2, 4th Royal Ascot Hardwicke S., Gr.2, York Dante S., Gr.2. BLATANT (Machiavellian). 3 wins at 1600m, £53,000, €116,020, 699,200Dhs in Ireland and U.A.E, Nad al Sheba Sheikh Maktoum al Maktoum Challenge S. No.1, Gr.3, Tralee Ruby S., L, 2d Milan Premio Vittorio di Capua, Gr.1, Nad al Sheba HH Sheikh Maktoum Al Maktoum Challenge S. No.2, Gr.3, Curragh Solonaway S., L, 3d Newmarket Queen Elizabeth II S., Gr.1, Nad al Sheba Burj Nahaar S., Gr.3. FLEET STREET (Street Sense). 6 wins from 1600m to 1800m, 112,107,000¥, Hakodate Elm S., Gr.3, Fukushima Adatara S., Tokyo Hyacinth S., Oume Tokubetsu, 2d Hanshin Minoo Tokubetsu, 4th Kanazawa Hakusan Daishoten, L.
SKY LANTERN (Red Clubs). Joint Champion 2YO Filly in Ireland in 2012. Champion 3YO Filly in GB in 2013. 6 wins-3 at 2-from 6f to 1m, £658,566, €174,375, The One Thousand Guineas, Gr.1, Curragh Moyglare Stud S., Gr.1, Newmarket Sun Chariot S., Gr.1, Royal Ascot Coronation S., Gr.1, Naas Fillies' Sprint S., L, 2d Newmarket Falmouth S., Gr.1, Goodwood Prestige S., Gr.3, Newmarket Sweet Solera S., Gr.3, Nell Gwyn S., Gr.3. ARCTIC (Shamardal). 4 wins-3 at 2-to 6f, £4,933, €139,520, Curragh Round Tower S., Gr.3, Grangecon Stud S., L, 2d Fairyhouse Belgrave S., L, Curragh Paddy Power Sprint H., 3d Curragh Phoenix Sprint S., Gr.3. SHANTY STAR (Hector Protector). 4 wins-1 at 2-from 2000m to 3250m in GB and U.A.E, Royal Ascot Queen's Vase, Gr.3, Nad al Sheba Wasel S., 2d Nad al Sheba Shadwell Farm P., Green Desert Cup, 3d Lingfield Derby Trial S., Gr.3, Newmarket Godolphin S., L.
HINTON ADMIRAL (Spectrum). 16 wins-3 at 2-to 7f, £126,997, Doncaster S., L, Lingfield Spring Cup, L, 2d Ascot Pavilion S., L, York Rockingham S., L.
DANCHAI (Authorized). 3 wins from 1850m to 2150m, £115,608, A$214,855, to 2014-15 in GB and Aust, Ipswich Cup, L, 2d ATC Japan Racing Association P., Gr.3, BRC Chairman's H., Gr.3, 3d ATC Winter Cup, L.
ALA HOUNAK (Sexton Blake). 6 wins-1 at 2-from 1¼m to 2¾m, Goodwood March S., L, 2d Newcastle Newcastle Brown Ale Northumberland Plate H., 4th Chester Ormonde S., Gr.3. Sire. Ala Mahlik (Ahonoora). 2 wins at 2, 2d York Musidora S., Gr.3, Meadowlands Boiling Springs H., Gr.3, 3d Newmarket Nell Gwyn S., Gr.3, 4th The One Thousand Guineas, Gr.1. Producer. Dannec (Danehill). 8 wins from 1600m to 2200m in Germany, 2d Grosser Preis der Stadtsparkasse Dortmund, L.
Manaafis (High Estate). 3 wins-2 at 2-at 7f, 1½m in Ireland and U.A.E, 2d Curragh Silver S., L, 4th Leopardstown Ballycullen S., L.
RIVER SEVEN (Johannesburg). 5 wins-1 at 2-at 1m, 8½f, US$810,266, Churchill Downs Commonwealth Turf S., Gr.3, Woodbine Grey S., Gr.3, Gulfstream Harlan's Holiday S., L, Woodbine Labeeb S., L-twice, 3d Woodbine Nijinsky S., Gr.2, Connaught Cup, Gr.2. Nomistakeaboutit (Affirmed). 2 wins at 8½f, 2d Woodbine Flaming Page S., L. Producer. Zia (Munnings). Winner at 6½f in 2015, 3d Woodbine Star Shoot S., L, 4th Woodbine My Dear S., L.
SUBITODOPO (Fraam). 10 wins-1 at 2-from 1600m to 2400m, €206,333, Rome Premio Francesco Cadoni, L, Premio Baybird, 3d Florence Premio Toscana, L, Livorno Criterium Labronico, L.
REMARQUE (Marju). 6 wins from 1200m to 1600m, €161,367, 13,248Dhs, Rome Premio Tudini, Gr.3, Premio Aringo, Milan Premio Giulio Bassignana, Rome Premio Tenerani, Premio Caro, 2d Rome Premio Daumier, L, 3d Milan Premio Chiusura, Gr.3. Ravanello (Spectrum). 6 wins-2 at 2-from 1400m to 1800m, €130,646, 56,778,631L., Milan Premio Alberto Chantre, Rome Premio Giuseppe Cesetti, 2d Rome Premio Torricola, L, 3d Milan Premio Luciano e Gino Mantovani, L. Producer.